Giving birth isn’t an easy feat. And while some would say that your body will never be the same after giving birth, it is definitely possible to get back in shape immediately. It will take patience and dedication since it could be longer than what you see from celebrities and other personalities because not everyone has that lifestyle, but it’s not impossible. You’re going to start gaining weight when you become pregnant because you’ll need more calories and nutrients for a growing baby inside you, and your hormones will be in limbo, too. While you’re going to crave for lots of things, sugar and refined carbohydrates included, make sure that you don’t give in to this feeling the whole time. Opt for healthy snacks like those offered by Snack nation snack delivery instead of reaching out for doughnuts, chocolates, or ice cream all the time. In addition, being pregnant doesn’t mean that you can stay in bed all day. It’s best to be watchful with your diet while you’re pregnant and perform doctor-recommended exercises because this can influence how easy or difficult it will be for you to lose some pounds after giving birth. There are definitely lots of benefits to breastfeeding, despite the controversies behind it. One of those is that breastfeeding your baby actually burns an additional 600-800 calories a day. This is why you shouldn’t suddenly drop your calorie intake when doing this so that you provide quality milk, but continue to watch your food portions. Even while you’re still unable to perform exercise routines right after delivery, breastfeeding can help you shed the baby weight while sitting comfortably. Besides watching portion control, avoid eating empty calories and fat like soda, chips, sweetened fruit drinks, pastries, and others. Eat small, frequent meals. This helps avoid cravings that could lead you to eat more. Consume proteins like lean meat and fish to lessen hunger. Don’t skip breakfast. It’s the most important meal of the day and is vital to start your blood glucose levels right. Add soluble fiber into your diet like flax seeds, chia seeds, beans, and legumes. You might think that being a mother to a newborn is rewarding but stressful, and it’s just impossible to get some rest. There are plenty of healthy ways to destress like getting into meditation and doing simple breathing exercises. Whenever your baby is asleep, don’t forget to get some rest yourself. Your body needs to recover from giving birth, and having adequate rest promotes faster healing so that you can go back to doing more activities. Take naps, sleep for at least eight hours at any given chance, spend 10-15 minutes a day to disconnect and just relax. You’re most likely not ready for more vigorous exercise until six weeks from giving birth, or more if you had a C-section, but that doesn’t mean that you shouldn’t keep moving. 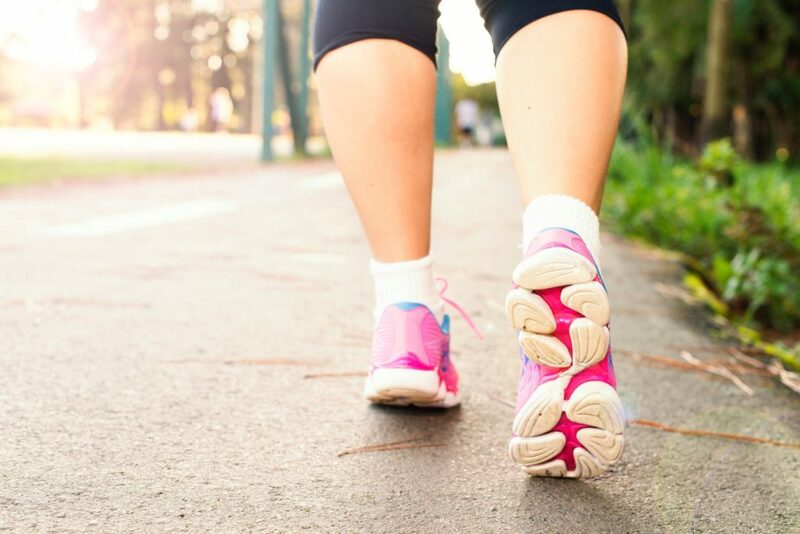 Start walking as soon as the doctor allows you, to promote proper blood circulation and burn calories. You can start with 5-10 minutes a day, observe if you’re not excessively exhausted or bleeding and progress as you get stronger. It is very important that you consult your doctor before getting yourself into more physical activity. After giving birth, your abdominal muscles have a gap and it’s critical that this gap closes before you do any strenuous exercise. A study has shown that postpartum exercise improved quality of life so it’s best to make time to burn some calories not just to get back in shape but for overall health. Kegel’s exercises and pelvic tilts to strengthen your pelvic muscles. Basic crunches as soon as the abdominal gap closes, mostly after six weeks after giving birth, or more if you had a C-section. Mild cardio routines like squats and lunges help burn fats and increase your metabolism. Always be observant with your body and the effects your exercise routines are giving you. If there is something unusual like excessive heavy breathing or bleeding, consult your doctor immediately. If you want to get back into shape after giving birth, it’s important to impose self-discipline and be faithful to follow routines. Breastfeed, eat and rest well, and exercise your way to get the pre-pregnancy shape you want back.